Day after day, a boy tends his cows and watches the sky. The grass is brown; the animals dying; the trees unable to put forth leaves. The clouds cast shadows but release no rain. One day, an eagle flies over- head and a feather floats to the ground. The boy makes an arrow from the feather and shoots it into the dark clouds. The rain falls in sheets. Under the wrecked frangipani bush, the bird sits like a steamboat. It’s a Barbary duck, I think, with that strange red head that looks melted, as if a new face has run down and set on top of the old one. ‘Is it an orphan?’ asks Sarah. The rain has pelted down all morning, making the red dirt shine. The locals will be glad: the dry season lasted forever apparently and killed half their livestock. The bird makes a whirring sound. ‘It’s wagging its tail,’ says Sarah. At the bottom of the compound Chidike comes out of his hut, wearing the regulation red check shirt that the oil company pro- vides for everyone’s servants. ‘It’s time for your nap,’ I tell Sarah. ‘We dry she feather,’ says Chidike. ‘That’s different,’ I say, glancing at him. But I know he’ll never be on my side. While Sarah is in her room, Chidike digs a hole behind the house. Jim gives him one of the thick pink plastic bags they use to keep the dynamite dry and by the time she comes out, Chidike has anchored it with stones and fitted the hosepipe to the outside tap. He and Sarah stand together, watching water trickle into the new pond. When she finally comes in, she’s covered in mud. I can’t help gasping. I spent hours on the sewing machine making that dress. The fabric here is wonderful, so gaily patterned, even if the dye does run. I nod. I was a teacher back in England. Letting things drop is my main job here. The duck isn’t the only thing the rains bring. The next day when I’m making dinner, the insect mesh on the back door rattles. It’s a pleasant voice. Still I shout for Chidike, who’s meant to field callers. I go on fiddling with the oven. It’s a Creda Simplex, all the rage here, but I haven’t seen one in England for years. The temperature knob’s so basic. Baking is hit and miss. Of course, Chidike doesn’t come. The voice is like wind chimes. I open the door to a man in sagging khaki shorts. He is barefoot and bony, his skin the colour of damsons. I don’t know what to do. The rules are different here. You try and pick things up from the other wives, but your mistakes are one of their main sources of entertainment. The man draws a wilted paper from his shorts pocket. It says Nigeria Hotel and Catering School. ‘Certificate!’ he says, and pushes it at me. I step back. This is how they get you, the wives say. They make you take something and then before you know it they’ve moved all their women, children, uncles, goats, chickens and monkeys into your servants’ block. ‘I have nothing for you,’ I say. That isn’t strictly true. But one day Chidike will learn to take instructions from a woman. The leather thong around his neck looks as if it has been there always. Next to it he wears a silver cross on a chain. Behind him by the pond, the duck rummages under its wing. It’s cleaner already, a cloud come down to earth. I glance at his ribs, his collarbone. Not an ounce or even a tablespoon of spare flesh on him. His feet are cracked. ‘Yes,’ he says, as if I’ve asked him a question. ‘I from Owerri side.’ He points at the hills. They are red today. Sometimes they are purple. Owerri is thirty miles distant. Has he walked all the way? ‘What’s your real name?’ I ask. ‘Kedu aha gi?’ That’s Igbo I think. There are other tribes in the Delta but I can’t remember their names. He looks away. Perhaps it’s a rude question. He pulls something else out. It’s a Polaroid photo, of an old woman standing in front of a hut. She has his skin and wears a wrap patterned with orange sunflowers. Her arms are sticks; the fabric is clean and bright. Five children stand about her, three items of clothing between them. A man’s shirt comes down the ankles of a small boy. ‘Are these your children?’ I ask. ‘Your mother?’ He frowns. He doesn’t seem to like questions. ‘Your family, perhaps,’ I say. I wonder where his wife is. And suddenly I am holding the photo and he is grinning. I can see the wives saying I’m weak; have fallen for a trick. I can hear the relish in their voices as they pass the story round. But I hear myself asking if he wants a glass of water. He looks worried. ‘You are thirsty, perhaps,’ I say. I thought he did own it, but I say nothing, just tip the last of the Fray Bentos steak and kidney pies from the pan where it has been boiling and wonder if they’ll ever get more in at Kingsway. Even frozen chicken is getting scarce. ‘The sooner he grasps the notion that land can be bought and sold, the better off he’ll be,’ says Jim. Out of the window, Sarah claps at the duck. She’s been out there all afternoon training it. There’s nothing wrong with that, I suppose. But how long will the duck stick around? I don’t want her getting attached. I begin opening the pie tin. The gravy is solid. I frown. I told Michael I’d ask at the British Club; that it would take a day or two. But he sat down with his back against the side wall, immediately comfortable as though waiting was something he understood. Ice clicks against his teeth. I wonder what will happen if Jim finds oil. I wonder what will happen if he doesn’t. I glance at the cupboard. Inside, the photo and certificate stand between bags of flour. No one looks in there but me. A proper oil company wife would have thrown them out by now, assuming they were fakes, which they probably are. If she’d ever accepted them in the first place. I slide the pie onto a plate. ‘I told him there was a rifle in the house and I wouldn’t hesitate to use it,’ says Jim. I take the peas off the heat. Jim grunts and goes out. Cooking, sewing, the needs of grow- ing children: all these things are outside his ken. When I open the back door next morning, Michael is there again, leaning against the wall. I assume he’s wearing different shorts, until I see they are yesterday’s, wet through. ‘Hello. Hello,’ he sings, his teeth chattering. I don’t know what to say so I go down the compound with the teapot. He follows. The duck is by the generator. It likes the generator, which is warm and has a heartbeat of sorts. I throw the tea leaves on the compost heap. ‘What for Madame heap him rabis?’ asks Michael. He nods. I don’t think he’s understood. There’s a spade by the compost heap and I dig it in. The stuff at the base is already black. It’s always a shock, how quickly natural processes happen out here. How quickly things grow; how quickly they die. I hold my hands around the fat girth of an imaginary yam. He looks blank. I take a spade full of compost and lead him to my broken frangipani. I spread it around the bottom of the bush, and pat it down. That evening while I’m laying the table, I tell Jim I’ll take the money out of my housekeeping. Jim goes to the drinks cabinet. Gordons, Captain Morgan, Famous Grouse, Campari, Warninks: a rainbow of bottles. He pours himself another whisky. It’s true, I did say that. But I suppose one says a lot of things. The first dish Michael serves is chicken, a frozen one I’ve managed to get at Kingsway. He bears it in on a chopping board and sets it in front of Jim. He’s covered it with my cut-glass bowl. Over his shorts and a red check shirt, he wears my apron with the yellow daisies. It’s too big for him, but then most clothes are. ‘What’s he doing with the trifle dish?’ shrieks Sarah. ‘Don’t talk about Michael as though he isn’t here,’ I say. Our carving set, a wedding present from seven years ago, lives in a blue velvet-lined box. Jim hones the knife on the steel. ‘A tad too long, by the looks of things,’ says Jim, as the smoke clears. Sarah’s laugh is almost a scream. ‘That’s the first I’ve heard of it,’ says Jim. In the kitchen, Chidike leans by the back door. Michael is lurking by the sink. ‘Are there any vegetables?’ I ask him. ‘This bloke’s a bit of a joke, isn’t he?’ says Jim when I go back in. Mandy Sutter grew up in Kent but now lives in Yorkshire with her partner and a large black dog called Fable. 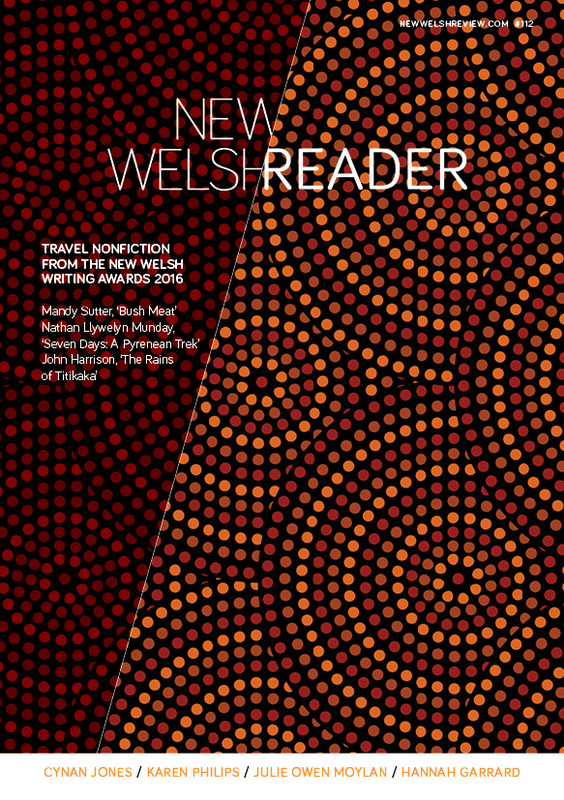 ‘Bush Meat: As My Mother Told Me’, from which this extract is taken, won the New Welsh Writing Awards 2016: University of South Wales Prize for Travel Writing this summer and will be published in an ebook in our New Welsh Rarebyte imprint. This travel memoir explores the time her family spent in Nigeria in the mid 60s. Mandy has co-written two books about the lives of Somali women, published in 2006 and 2007, and her first novel, Stretching It, came out in 2013. She has also published three poetry pamphlets with independent presses. Our three-minute prizewinner video animation of 'Bush Meat' can be viewed at Multimedia and it also features in a ten-minute shortlist showcase video at the same address, with author presentation and readings.